Our customers can avail from us superior grade Cables. 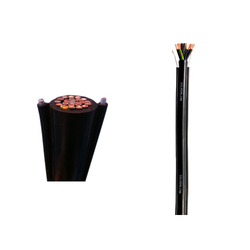 The cables offered by us are manufactured by our skilled professionals by making use of modern machines and tools. Pendant / Round Cable are made for heavy duty applications in particular for pendant push button stations and moving electromechanical components. The two steel wire ropes are embedded, diametrically opposed to PVC sheathing. The rope cut into length and just hooked to the pendant trolly to avoid any stress on the cable. We are a trustworthy organization in offering a wide gamut of PVC Flat Cable. Extensively Oil Resistant Chemical Resistance . PVC self -Extinguish and Flame Retardant.